Our NHS is essential. We all use it, and we all rely on it for our care and that of our friends and families. We believe the Accident and Emergency Department at Queen’s Hospital in Burton must remain open. We object to the suggestion in the Staffordshire and Stoke-on-Trent Sustainability and Transformation Plan (STP) that Burton A&E might be considered for closure, and we demand that 24 hour A&E facilities at Queen’s Hospital in Burton are retained. The STP is wrong to propose downgrading one of the A&E departments in Staffordshire, one of Burton, Stafford or Stoke. It is absolutely essential that Queen’s Hospital in Burton retains its A&E department. The town is too big and the demands on the service too great for us to be without it. It already accepts patients from a wide catchment area and is very highly subscribed. Staffordshire is a large rural county, and it is important that the A&E at Burton is retained to serve East Staffordshire and the surrounding areas. We must protect the 24 hour A&E in Burton, and so I will be leading a campaign to make sure we keep this vital service in our town. I need your support. 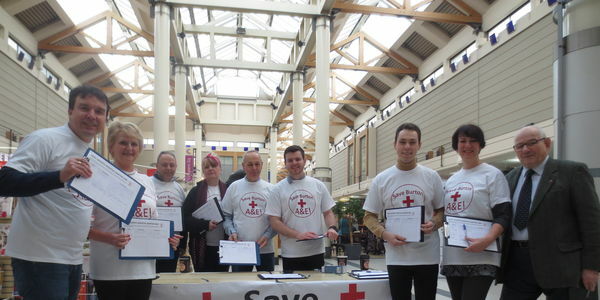 Please sign my petition Save Burton A&E here… and like the Facebook page. We need to tell Staffordshire health bosses that Queen’s A&E is essential to our town. It is important that we get value for money in the NHS and constantly improve the service. So I welcome the Sustainability and Transformation Plan (STP) that was published this week by Staffordshire health chiefs. The aim of the plan is to provide a better healthcare system for everyone, with more joined up care, more efficient treatment, and crucially, making mental health as important as physical health. A lot of the proposals are very sensible and will make the county’s healthcare easier for patients to use and sustainable for the future. WE DID IT! Burton A&E is to remain open!